Boris Spassky (b. January 30, 1937) is one of the most respected, most popular GMs in the history of chess. He won the World Championship against Tigran Petrosian. Spassky was competent in the openings and has some variations named after him. But it was in the middle game that he really excelled. He could win a scientific slow burner against Petrosian or he could be last man standing in a dramatic roller-coaster against Tal. He was known for deeply calculated positional play which sometimes incorporated deep sacrifices. He was also capable of violent, attacking combinations with pieces being sacrificed right, left and center. Best of all he could marry both themes in the same game. Garry Kasparov said of him: The universal chess style, characterized by the ability to play quite different types of chess positions, is considered by many to derive from that of Boris Spassky. But I think that the general idea that Spassky has a universal style overlooks the fact that from an early age, Spassky had a bent for sharp, attacking play and a good eye for the initiative. Boris Spassky was born in St Petersburg, then called Leningrad, but spent the war years in the Ural Mountains where he learned to play chess. He was known to the Soviet chess fraternity as early as the age of 10. It was then that he beat the soon to be World Champion Mikhail Botvinnik while taking part in a simul. The master Vladimir Zak had coached him as a child. The exposure gained through his win over Botvinnik opened doors. From 10 onwards he worked on his game for four or five hours a day with several Soviet masters. He became the youngest Soviet player to achieve First Category Rank (aged 10), Candidate Master Rank (11) and Soviet Master Rank (15). At the age of 15, he finished in the middle of the pack in the Soviet Championship and finished runner-up in the prestigious Leningrad Championship. Spassky made his first appearance outside the USSR in 1953. He and his trainer, Alexander Tolush, competed in a tournament in Bucharest, Romania. Tolush topped the table and Spassky finish joint fourth with a score of 12/19. For this he was awarded the title IM by FIDE aged just 16. He competed in the Soviet Championship for the first time in 1955. He finished joint third with only Vasily Smyslov and Efim Gellar ahead of him. This result put him into the Interzonal Championship which was a preliminary for the World Championship. He won the World Junior Championship also in 1955 before taking joint seventh place in the Interzonal which qualified him for the Candidate's Tournament. This was an important achievement as it automatically made him a GM, the youngest player ever to achieve it (18) at the time. He finished a respectable joint third with four others. Spassky hit a lull during the latter half of the 1950s. But he changed coaches from Tolush to fellow Russian GM Igor Bondarevsky. Bondarevsky changed the tone of Spassky's play from the tactical violence of Tolush to assured positional play. Spassky's positional play rose to a standard equal to his brilliant tactical awareness. He was now becoming the complete player. His results improved significantly to reflect his growing strength. Spassky was back better than ever. He won the 1961 USSR Championship in Baku, Azerbaijan. He won Belgrade 1964 and finished in high places in several other tournaments around this period. Spassky was growing in confidence with his game for all seasons and began to think about the biggest prize of all. Spassky qualified easily from the Soviet Zonal Tournament in 1964. He went forward to the Interzonal Tournament in Amsterdam where he tied for first with Mikhail Tal, Vasily Smyslov, and Bent Larsen. He had reached the Candidate's Tournament to be played in 1965. Now he would play for the right to face Tigran Petrosian in a match for the World Championship. The tournament was ran on a knock-out format with 8 competing in quarter-finals. Spassky beat Paul Keres in his quarter-final, then Efim Geller in the semis. He then beat former World Champion Mikhail Tal in the final. Spassky now had Petrosian in his sights. Iron Tigran was waiting in Moscow for his challenger. In 1966 he was playing the best chess of his life. But Spassky was also on an irresistible upward curve. An interesting final was in prospect. The battle raged over 24 games between these two masters. In the end after a hard fight, the champion Petrosian prevailed on a score of 4-3 with 17 draws. Spassky would have to wait for his shining moment. But he would not be delayed forever. He again won the Candidate's Tournament in 1968. This time he won through against Geller, Larsen and finally Victor Korchnoi in the final. A year later he was back to face Petrosian again. It was a different story this time as Spassky took the crown, winning 6-4 among 13 draws. The following three years were probably the best of Spassky's career. He won San Juan 1969 in Peurto Rico. He was victorious in Leiden 1970, a four man event, ahead of Larsen, Botvinnik and Donner. He also shared top place finishes in Amsterdam, Holland in 1970 and Vancouver, Canada in 1971. Inevitably a challenger to Spassky's title would appear on the horizon. A new force in world chess was forming in the shape of Robert J Fischer. Fighting out of Chicago, Illinois, (later NYC), Fischer was the most exciting prospect to come out of the United States since Paul Morphy, a century earlier. Fischer progressed up the chess ladder during the 60s and won the Candidate's Tournament in 1971. This was during the height of the Cold War Era between the two global superpowers at the time, the USSR and the USA. Chess had been highly politicized in the Soviet Union for decades. Now with Fischer reaching the World Championship against a Soviet, Americans took an unprecedented interest in the game. The two players were styled as gladiators, each representing his civilization against the nemesis, in a proxy war. Chess was under the global spotlight like never before or since as the two protagonists faced off in what would be dubbed the Match of the Century. The match took place in Reykjavik, Iceland in 1972. Spassky was under a lot of pressure from the Soviets to win. Fischer carried the hopes of the American nation. The match was covered by TV, radio and print media all over the world. Spassky got off to a great start in the first game playing as White. In a drawish bishop ending Fischer blundered inexplicably. He got his bishop trapped and lost it for only two pawns. Spassky won the endgame and was 2-0 up in the match when Fischer forfeited the second game in a row over cameras and a subsequent no-show. But after that Fischer, who had come into the match on a recent 20 game winning hot streak found his form. He won five of the next eight games to lead by three points after 10 games. The second half of the match was very tight with mostly draws. Fischer won two further games to Spassky's one. The final score was 7-3 with 11 draws. Spassky had lost the title. Spassky never regained his title but he did enjoy great form for many years after Reykjavik. He won Dortmund 1973 against a strong field. He picked up his second USSR Championship in a field that contained all of the strongest Soviet players. In 1974 he tried to fight his way back to a rematch with Fischer. In the Candidate's Tournament quarter-final he played another American, Robert Byrne. Spassky beat Byrne but fell in the semi-final to rising talent, Anatoly Karpov. Three years later he beat Vlastimil Hort in the quarter-final and then Lajos Portisch in the semis. He fell at the final hurdle though when Korchnoi beat him 7-4 with 7 draws. Spassky moved to France in 1976 and has lived there since. He played at Candidate's level up until 1985 but could never again make the break-through. He played now and again throughout the 90s. Spassky wasn't renowned as an opening specialist but he does have variations in some openings bearing his name. One is in the Marshall Attack which is one of Black's responses in the Ruy Lopez Opening. He also contributed to both sides of the Nimzo-Indian Defense. He made the Sicilian Defense a better place and came up with ideas for the King's Indian Attack. We are advised to play the middlegame like a magician and as you can see just by looking at his most famous games, Spassky certainly did. This was the stage that became his forte. His positional plans were deep and his tactical assaults were deadly. His calculating was so accurate that he could sacrifice a piece without any apparent compensation showing up until several moves later. Fischer even said of him once: Spassky sacrifices his pieces with the utmost imperturbability. He can blunder away a piece, and you are never sure whether it's a blunder or a fantastically deep sacrifice. He sits at the board with the same dead expression whether he's mating or being mated. Boris Spassky is credited as the pioneer of the universal chess style. He is said to be the first heavyweight chess legend to excel in both tactical play and positional chess. Earlier masters, though at least competent in all facets of the game, were always categorized by one label or the other. Spassky managed to raise both themes to astonishing levels. Paul Morphy came out of the United States in the 19th Century to humble the chess world. His breath taking skills on the board contrasted sharply with his inability to function in other areas of his life. The next great US chess legend would exhibit remarkable parallels to Morphy. Someone like Spassky could only be replaced by a unique talent. His conqueror in Reykjavik, Iceland was Bobby Fischer. 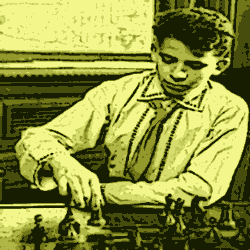 This link takes you from Boris Spassky back to your Homepage. Your Homepage is where you get a site overview. There you can see all of the resources on offer in this web site.